Gaz Frost, one half of the producter/DJ duo Congi out of Nottingham, UK, agreed to sit down for an interview representing the Chord Marauders at Shambhala Music Festival 2018, but was too exhausted from travel on Saturday to sit down with us. The Chord Marauders, a jazz-infused 140 bpm artist collective and record label, have been pushing one of the most original sounds in dubstep since forming in 2012. 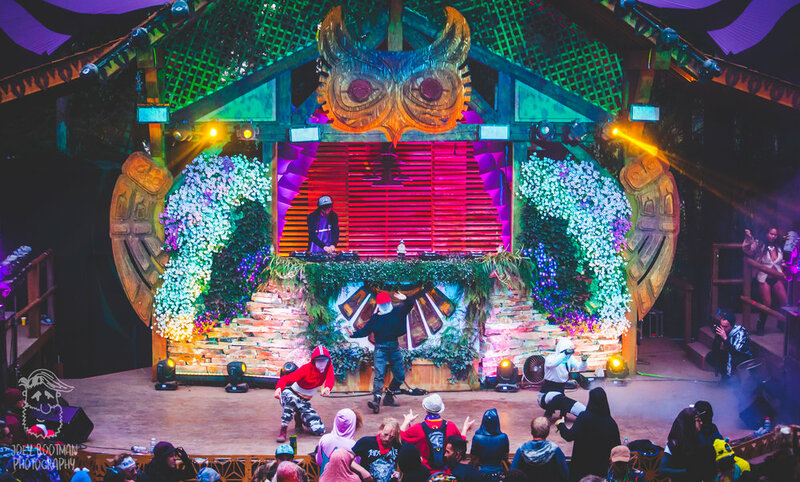 Shambhala, which rarely curates spotlights or showcases on its lineup, booked the Chord Marauders for a label showcase at The Grove stage on Sunday. Looking for Gaz Frost that Saturday, I ran into Jafu, one of the Marauders’ four founding artists, and learned a bit about him (James) personally in the process. Not only does Jafu not play many shows, he also doesn't attend many shows either; Shambhala 2015 was not only the first actual “show” (certainly festival) he'd ever played, it was also the first show he ever attended, and the first time he ever flew on a plane. With that kind of magic relationship with Shambhala, it felt appropriate that he too sit down for the interview, which we were able to conduct on Sunday morning. Eager to investigate the hows and whys of the fantastic burgeoning sounds of their unique dubstep, I got on well enough with them to learn about some of their early influences, the place Shambhala held in their development, and the next steps the label wanted to take to push their sound further into the North American scene. The Rust: Chord Marauders began forming in 2012. What were those early years like, what was the culture amongst yourselves, what was the energy in the air? James: There was a little bit of lacking in that department. Gaz Frost: Absolutely! It was kinda unheard in a way. James: Yeah, I always liked tracks like “Alicia” from Mala, “Show Me” from Von D, stuff like that. Just a more soulful sound. Gaz Frost: Sure, like drawing on the jazz influence and the more RnB stuff as well. And I think that's where we honed in, kinda made that area our own. The Rust: Did George mostly find you guys? James: Yeah, George was the one who got us all together in a group and pitched the idea that we should all form a collective. The Rust: What's the culture between producers? Do you send each other tracks early on? Is there much collaboration or do you mostly share completed work? James: These days we've been doing everything pretty complete. Especially with the Groove Booty compilations, we'll source stuff, feed off each other, see what's good, what's going on. Gaz Frost: There is a lot of times where we'll swap half-finished tunes. Like the tune you [Jafu] sent me just the other day; there's always some stuff kinda floating around. James: Tons of unfinished bits. Gaz Frost: Absolutely, there's also tons of stuff that each producer finishes on their own, and stuff we work on together. I guess it's really just the cohesion of the sound [of the label] that makes it possible. The Rust: How are the curated artists for the Groove Booty compilations found, and who decides what makes the cut? James: Usually it'll be a group decision who makes the cut; if we all really like the artist, they'll probably make it on there. And usually we get sent a lot of stuff and we'll source things from SoundCloud (we love SoundCloud). Gaz Frost: Yeah, we get sent a lot of music from up-and-coming artists. James: And a lot of those guys send great stuff. The Rust: How did FLO become the first artist to be signed to Chord Marauders? Gaz Frost: I don't really know, it's mad! I think George was being sent bits from FLO, shared it with us. The Rust: Gels with the aesthetic? Gaz Frost: Yeah, absolutely, for real! The Rust: With this Shambhala showcase, Chord Marauders is getting more attention in the North American market. Any upcoming tours on the horizon or plans for breaking the wave? James: We can't say for sure, but they’re definitely possibilities we're looking at in the US and overseas. Gaz Frost: I think the US is the next one we want to try to occupy, because there's quite a demand out there for this. We just need to arrange it. James: Yeah, there's St. Louis area and Denver so far. The Rust: Really, St. Louis? James: Yeah, do you know a guy named Yo Adrian? That's what he goes by on Facebook, he's an event coordinator in the area. Does lots of EDM stuff, some IDM stuff, he's a big event coordinator we've been in touch with. The Rust: What's next for Chord Marauders as a releasing label? Gaz Frost: I think Flo's got an EP ready to go. We've been working with a guy named Soma, he's got some amazing stuff; just got an EP from him. Hopefully will be releasing that this year. Other than that, just looking to stack for the next compilation. James: And we're all always working on getting our next releases out. I've got an LP I'm working on right now. The Rust: How did you guys first start listening to electronic music, and dubstep specifically? James: I had always imagined electronic music to be a specific sound. When I was growing up, it was all just techno/rave/hardstyle, so my opinion on it was completely filtered through that. After I discovered Aphex Twin, I was more open to organic sounds being used in electronic music, for a different approach. In 2009, I was introduced to the song “Skeng” by The Bug, and that song was the one that changed it for me. It was a different sound than I'd been hearing, turned me onto the scene massively. Gaz Frost: For me, it was all about early grime music. When grime music first started being made, everybody was listening to it. Everyone had it on their phone, everyone was an MC, that was just the time that it was. That was how I grew up, you know what I mean? I was like 13, 14, Dizzee Rascal came out with Boy in the Corner, I thought that was the sickest album. That was my first taste of electronic music, like “what are these sounds, how are these sounds being made? !” That was like 2003-2004, somewhere in there. The Rust: How did the Congi project start? Where did you and Tulip meet? What was the scene like in Nottingham? Gaz Frost: We've got a friend called Ninja who produces lots of beats, he's a mutual friend of ours, met at his house. I didn't know Tulip, Tulip didn't know me, but we actually went to school together. He [Tulip] and I got to know each other, started to mix together. He'd always bring his vinyl around, he taught me how to do that kind of thing. Yeah, we just started meeting up and making music together. It was fun, like we didn't plan it or nothing! From there we started to get, like, quite serious with it, find an outlet to release. The scene in Nottingham was really interesting, there was a lot of guys doing dubstep. Like there was this one guy, Geome, he's massive. For me, he was really important at the time, [representative of] the really good stuff that was going around. And that's also sort of how we [Tulip and I] became friends, mutual friends recommending the same nights to us, stuff like that. The Rust: What are some inspirations for the Congi project? Gaz Frost: God man, it's vast. Like, there's a lot of influence. There's a jazz project out of the UK called the Ezra Collective, a lot of really young jazz players. I've got a friend called Yazmin Lacey, she's an amazing singer. A lot of hip-hop, early grime, so like early Dizzee Rascal. That's the kinda stuff that really sculpted our sound. And there's a lot of R&B as well, like we both really like Destiny's Child and Jagged Edge, that kinda stuff. The Rust: Best shows you've played? In terms of crew, crowd, production value, whatever. Gaz Frost: Denver was sick. Also last year here [Shambhala], man! I'd never played in Canada before, last year was really fun. The overseas ones are always the best ones. I've played a little in Europe (Portugal a couple weeks ago), but the vibe over here is definitely different. From home, especially, home's a little bit weird! It's more appreciated out here, I feel. The Rust: Interesting! When did you feel that shift occurred? Gaz Frost: I don't know! I dunno how it happens, but at festivals like this, you can play what you want, and you don't have to worry about making people dance. That's the best part, you can try something out that you're not too sure about, and the crowd's really receptive to what you want to play. That's the big difference, I feel. We spoke about Shambhala this year and what was different (the lack of bridge at the Living Room shocked both of them). They were stoked to see Joe Nice, who was the “the undisputed dubplate king of America” according to these two. James mentioned the Jafu sound had evolved since his first Shambhala three years prior, based largely on said prior experience, saying he wanted to get the audience to skank more this time. Gaz Frost spoke about playing out in Brooklyn and a small show in York, Pennsylvania, which he felt was noteworthy for have a really strong, tight-knit community vibe. These are the only places besides Denver where Congi has played in the US, but Gaz maintained that Cervantes' Masterpiece was the best one-night show he'd ever played, ever. Overall, they both gave big ups to the dubstep following in the US and at Shambhala. How encouraging it is, they said, to be able to play for and interface with some of the most stoked fans and engaged audiences they've seen.